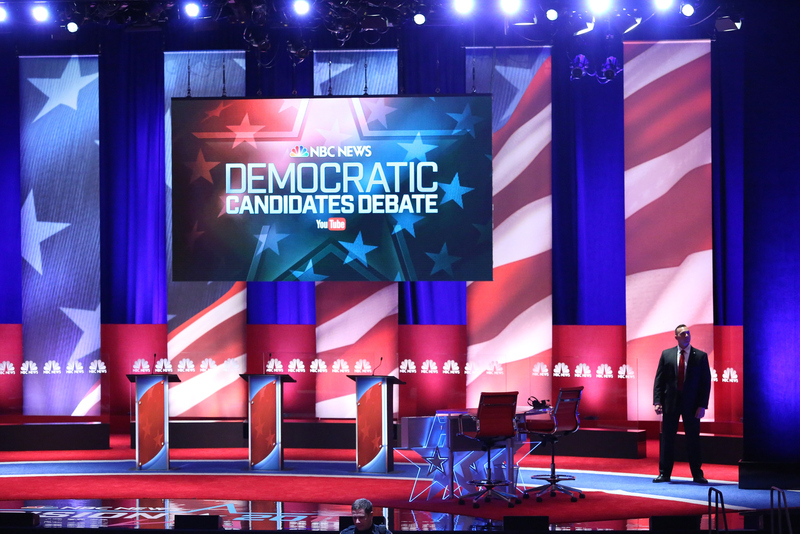 The fourth Democratic debate has the American public praising moderator Lester Holt and host organization the Congressional Black Caucus institute. Important questions are being asked about Black Lives Matter, gun control, and race in America. Candidates Bernie Sanders, Hillary Clinton, and Martin O'Malley have all been asked to answer the top three things that they're focused on and would tackle head-on if elected. The subsequent questions, however, illustrate just how needed a debate on race in America is for both Democrats and Republicans. Many on Twitter are cheering Holt's moderating skills as well as calling into question why such thoughtful prompts about race have yet to be delivered in a GOP debate. In candidates' opening statements, all three paid tribute to Dr. Martin Luther King, Jr and were clearly aware of the impending holiday celebrating his life and legacy. Sanders and Clinton immediately faced off about gun control, and though the exchange was revelatory, it was nothing compared to the explicit addressing of police brutality following a question about Walter Scott. The fact that Scott's name was mentioned at all sends a powerful statement and, for perhaps the first time this election cycle, a prominent candidate explicitly acknowledged the brash inequalities faced by minorities in this country. Clinton called for an end to systemic racism following the question on police brutality, questioning the country's response if the epidemic of officer-involved shootings more deeply concerned those who aren't minorities. NBC's partnership with YouTube served as particularly pivotal in driving a discussion on more prescient issues. YouTube star Franchesca Ramsey, whose videos discussing race has garnered millions of views, furthered that conversation by asking Sanders a question on local authorities' response and conflicts of interest regarding investigations of officer-involved shootings. "How would your presidency ensure that incidents of police violence are investigated and prosecuted fairly?" asked Ramsey, expressing her concern about local prosecutors "investigat[ing] cases of police violence within their own communities." Sanders suggested allowing the Department of Justice to investigate such issues, echoing the importance of cases in which law enforcement fatally shoot a suspect. Such a question has yet to be addressed on the right. It seems as if a majority of the GOP's discussion on gun control hinges solely on gun ownership and not the police brutality epidemic that has sadly gripped the nation. If the fourth Democratic debate is any indication of where subsequent debates are heading, let's hope the Republican events follow a similar narrative and have candidates finally start discussing racism and inequality in a deeper discussion that the country is desperately hoping for.